A huge number of entertainment superstars will be descending on Washington to take part in the festivities surrounding Barack Obama's inauguration. The first will feature an array of musical giants in the "We Are One" concert at the Lincoln Memorial on Sunday. It's free and open to the public. Among the performers will be 12-time Grammy-winning jazz musician Herbie Hancock, who told Early Show Saturday Edition co-anchor Erica Hill he's "stoked" at the prospect, adding he was "hoping somebody would call me to do something. I wanted to be involved!" 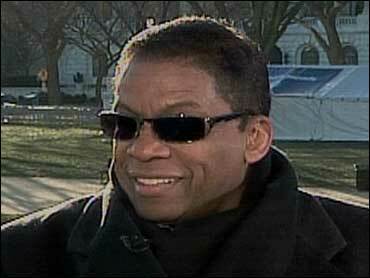 Hancock added that, as an African-American, Obama becoming president will be "phenomenal. I mean, we've heard this so many times: I never thought I'd ever see this in my lifetime. My daughter never thought she'd see this happen in her lifetime. So it's amazing. It is absolutely the right time. It's the right time  everything seems to be in sync, lined up." He says there are so many performers slated to appear at "We Are One" that, "They're combining people. But I think the idea is to take people from kind of different areas and put them together because that makes it a lot more interesting." Hancock will join with Sheryl Crow and will.i.am to do what Hancock called "Bob Marley's anthem, 'One Love.'" And his inaugural schedule doesn't end there. "Actually," he told Hill, "I'm performing for another event at the Martin Luther King Library, with Josh Groban. Martin Luther King III is going to be speaking, and (longtime civil rights leader and congressman) John Lewis (D., Ga.) will be speaking. That's pretty exciting."